Drayton Place community in Jacksonville, Florida. Drayton Place is a natural gas residential community located on Kernan Boulevard just north of J Turner Butler Boulevard and south of Beach Boulevard. 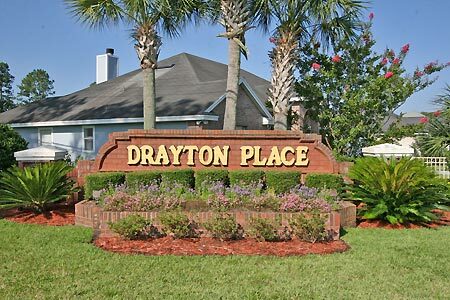 Drayton Place is in close proximity to The University of North Florida and just a short drive to Florida Community College, St. Johns Town Center, downtown and the Beaches. Quiet curving streets, conservation or lakefront homesites and convenient location are just a few of the many reasons why Drayton Place is highly sought after in Southside area. Community builder is Atlantic Builders (acquired by Mattamy Homes.) Built between 1996 and 2001, Drayton Place features 211 homes ranging in size from 1,400 square feet to 2,400 square feet. Situated near Glen Kernan Country Club and Jacksonville Golf and Country Club, Drayton Place is ideally located in one of the fastest growing areas in Intracoastal West areas and is just minutes from shopping, dining, schools, golf courses, entertainment and the pristine beaches of the Atlantic Ocean. The �First Coast� features miles of unspoiled beaches, ecological and nature based excursions, historical sites and architecture, sporting and cultural activities, unique shopping and dining, and numerous festivals and events. For a private tour and availability, please call (904) 307-8998.